When searching for the best women’s set to fit your golf game, it is critical to know how manufacturers create the clubs. From woods to wedges, companies have spent years tailoring women-specific clubs to develop maximum swing speed for striking the longest and highest shots of your life. Featuring 16 clubs including hybrids and multiple wedges to help you stay out of trouble around the greens. Highlighted by a large 460cc driver, the Strata set has been designed to promote forgiveness as well as distance from anywhere on the course. It is our pick for most women golfers. Starting with the woods, companies have found exciting ways to combat slower swing speeds by increasing the loft on the driver’s face to boost ball height and send drives deep down the fairway. The old steel shafted irons have been replaced with lightweight graphite shafted clubs that help women find that sweet spot on the club face with each swing. The best ladies golf clubs sets for 2019 utilize these unique innovations to help create a swing that will have you shooting the lowest round of your career. Here are ten sets for women that have set themselves apart due to their high quality and top-notch performance. 4.1 What are the differences between a men and women golf club set? 4.2 What clubs should a great women's’ golf club set include? From Callaway comes the Women’s Strata Aqua golf set featuring 16 clubs including hybrids and multiple wedges to help you stay out of trouble around the greens. Highlighted by a large 460cc driver, the Strata set has been designed to promote forgiveness as well as distance from anywhere on the course. All clubs in the Strata set come with graphite shafts for improved swing speed, and that helps with the distance provided by the hybrids and long irons. A 56-degree sand wedge is included in the Strata set for help in bunkers and long rough. The set is protected by the included stand bag that is stylish and roomy enough for as many balls, tees, and snacks that you could need. When breaking down the Strata Aqua set, we were immediately taken by how sharp the set looks from the box. The woods have large, forgiving club faces that instilled confidence from the first swing. The stainless steel heads on the irons are cavity backed and have large sweet spots that provided a solid feel once we hit the range. And we adored how the wedges performed from inside fifty yards. At first glance, this is a set worth its reputation. Once we dug a little deeper, however, we noticed a few nagging things that might force the average golfer to extend their learning curve. The Strata set comes with a 10.5-degree driver. We prefer a women’s set come with a 12-13 degree lofted driver to aid in getting the ball into the air, so this was a slight disappointment. Same goes for the ordinary blade putter as it will force you to think about upgrading due to its underwhelming performance. 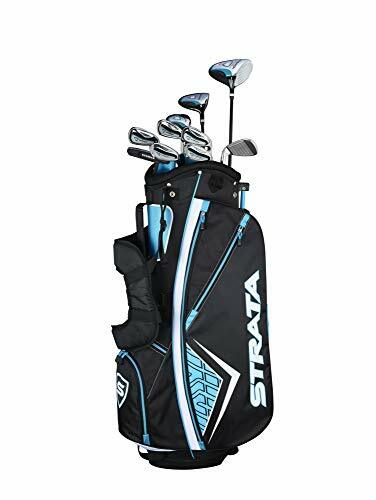 Affordable and thorough, the Callaway Strata Women’s Aqua Set is a dynamic performer that overcomes a few complaints to create a set of clubs that are ready to perform from the moment they leave the box. 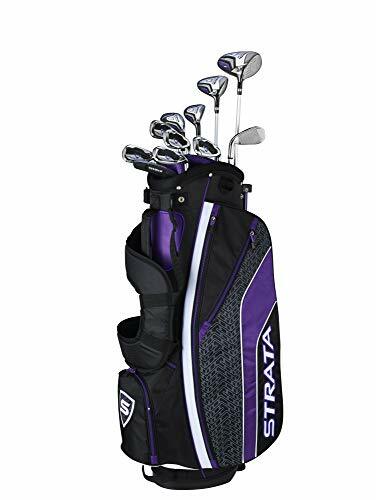 The Callaway Women’s Strata Ultimate Purple Set is a revelation, combining terrific design with high-quality material for a set that amazed us with the performance of each club. From the devastating 460cc driver to the fluid and lightweight irons, this Purple Strata set continually outperformed our expectations in every way possible. For a complete set of clubs, the Purple Strata set owns its competition through ingenious design and overwhelming performance. Although the driver does have a steep 10.5-degree loft, we found it continually bombed the ball straight down the fairway. We loved the feel of the driver and how stable it felt at impact. Concerning the graphite-shafted irons, the Purple Strata set begins at a 6-iron and ends with two well-made wedges, including a 56-degree sand wedge, which is something that is vitally important to us when reviewing a complete set. Featuring cavity backed, perimeter weighted club heads, the Strata set sent the ball soaring into the air at impressive heights and kept the ball straight even on our mis-hits. Even though we have slight reservations about the putter in the Purple Strata set, Callaway has done an excellent job to mill the putter face so that there is a reduction of friction that prevents skidding and gives the ball a true forward roll. 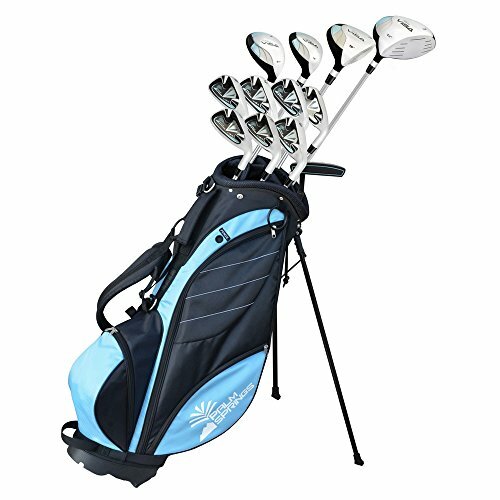 Rounding out this impressive set is a stand bag that is very lightweight and boasts two shoulder straps making it a joy to carry on the course. Multiple pockets line the side of the stand bag, giving the golfer plenty of room to carry snacks and other golf accessories. When you contrast the value of the set with the outstanding performance, The Callaway Women’s Strata Ultimate Purple Set is a straight-up classic. One of the best sets out there on the market for women is the Callaway Women’s Strata Plus Complete 14 Piece Set. With a high-lofted driver and a full complement of wedges, the Strata Plus set is worth every penny of its mid-level price. The set begins with the stellar 14-degree driver. For beginning golfers who need more height on their drives, Callaway has designed a driver that will ease your learning curve into more advanced clubs. The driver comes with a head cover to keep the club free of nicks and scratches. Same holds true for the fairway wood in the set that clocks in 15-degrees of loft as well as the hybrid that substitutes for a 5-iron. Both are high performers that shined on the course and come with head covers. If we do have one complaint about the 14-piece Strata set, it is the gap that exists between the fairway wood and the hybrid. With a set this complete, we would have liked to see the addition of another hybrid that was lofted in between the two clubs. This, however, is a minor complaint and certainly does not affect the performance of the set as a whole. The six graphite-shafted irons included in the set begin at the 6-iron and continue through the sand wedge. Cavity-backed with the weight centered low on the clubface, the Strata plus irons were boomers during our range session. With incredibly high ball flight and increased distance, this set of irons brought the goods. And although the putter is relatively standard, we found that it did an admirable job of rolling our putts during our testing session. Unlike other sets, we think you’ll do fine with this putter in your bag. Also included is the aforementioned stand bag with lined and padded compartments for each club. 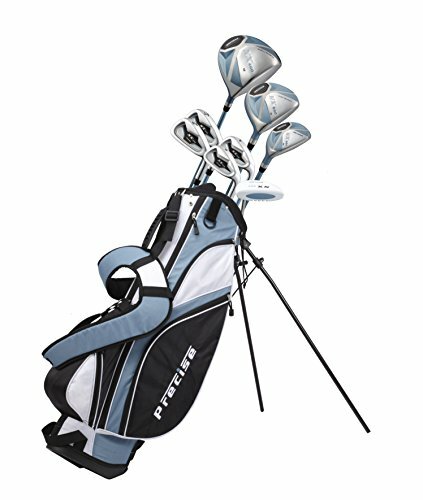 For golfers of all ages and levels, the Strata Plus 14-piece set is an absolute winner. The Precise NX460 Ladies Complete Golf Club Set is a slight yet robust set of golf clubs that touts several positives on its resume. Although on the outside it may look like a small set, Precise has chosen the included clubs wisely, breaking the set down into necessary elements. All considered, the NX460 set is an excellent choice for the golfer looking for an affordable price with minimal hassle. Starting with the woods, the Precise NX460 set comes with a driver, 3-wood and hybrid that takes the place of a 4/5 iron. All come with graphite shafts and have large club faces to promote forgiveness at impact. Although the woods are lightweight and easy to swing, we noticed that they have a hollow feel at impact that took some getting used to throughout our testing. We did find that the irons performed better than the woods and that has a great deal to do with their design. Starting with a 6/7 combo iron, the four irons included in this set also cover two wedges, making the irons primarily for shorter shots that don’t require much distance. This may turn away some amateur golfers, but for beginners and infrequent players, this feature works as a positive for the set. The mallet putter has a distinct look that matches well with the overall set, and we found that it performed admirably on the green. The stand bag included with the set is fine and will handle the eight-club set without a problem. For a low maintenance golf set that is ready to go straight from the box, the Precise NX460 Ladies Complete Golf Club Set won’t turn heads, but it does provide a solid golfing experience. The Palm Springs Golf Ladies Hybrid Club Set is an affordable, high-performing set of clubs that garners a few complaints but it broad enough to keep your satisfied with your purchase. The set comes with an extensive selection of four woods; a driver, 3-wood, and two hybrids. Also included, and one of the highlights of the set is the six graphite shafted irons. A hybrid blade-mallet putter is included with the stand bag. The driver in the Palm Springs set has a 460cc, and the oversized shape is intended to help increase the sweet spot as well as support forgiveness. Although the loft on the driver is 10.5 degrees, we liked the feel of the club during our time on the range. The 3-wood has a low center of gravity and makes it easy to get the ball in the air. The two hybrids take the place of the 3 and 4-iron and perform well from the fairway. The cavity backed irons start at the 5-iron and stop at the pitching wedge. We found little to complain about with the irons as they were consistent and reliable throughout the swing. A significant drawback for the set is the lack of a sand wedge. With the set stopping at the pitching wedge, the golfer is left without any clubs that have below a 50-degree loft. Gap and sand wedges are vital for lowering your scores and navigating tough areas around the green. If you buy this set, then you’ll want to add a high-lofted wedge immediately. We were also slightly annoyed at the ordinary blade-mallet hybrid putter that came with the set. As much as we loved the overall performance of the woods and irons, we were disappointed by the putter. But this oversight with the putter is common in most complete sets, and while we might look to upgrade sooner rather than later, the putter certainly doesn’t force you to grab another right away. The Wilson Women’s Ultra Complete Package Golf Set features a strong group of three woods and five irons wrapped with care in a high-quality cart bag that is lined and padded to protect the set. The set is headlined with by the three woods that come with the set; a driver, a 3-wood and a hybrid. All three are solid from anywhere on the course and are designed with a low center of gravity to assist in getting the ball up and down the fairway. Next, there are only five irons in this set, and although that may disappoint some shoppers looking for a more thorough iron set, these irons are very forgiving making them ideal for beginning and intermediate players. Cavity-backed and with large sweet spots, we really enjoyed the response we received from hitting these irons. 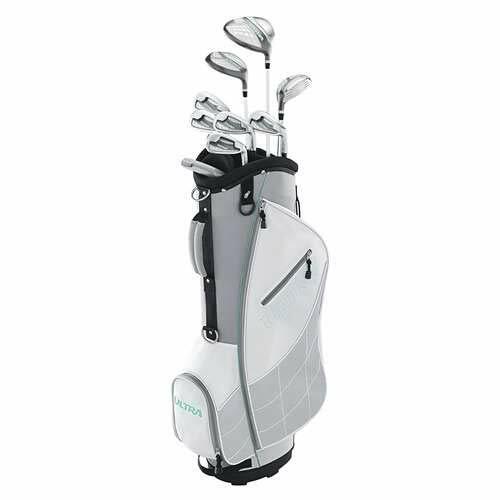 The accessory package in the Ultra set is a true home run because the included cart bag is well constructed and padded for complete protection of your clubs. Wilson has also added three soft matching head covers to preserve the clubheads on your woods and prevent them from banging into each other on rough rides in the golf cart. There are two chief complaints with the set, and they are mistakes that typically occur in a complete set. The first problem is the lack of sand wedge in the set. With only five irons, you’ll undoubtedly need to find additional irons and wedges to fill out your set. And the second issue we had with the set is the quality of the blade putter included by Wilson. It has the feel and look of a putter that you would typically find at an amusement park and not worthy of addition with these clubs. The Wilson Women’s Profile XD Golf Complete Set is one of the more accomplished golf club set we tested. With an emphasis on increasing distance, the Profile XD set features a stunning collection of high-quality woods, large and forgiving irons and two XD wedges that rival top-notch wedges you’d pay twice as much for in a golf shop. Starting with the woods, the Profile XD excels at creating a strong and stylish set that perform at a very high level. Whether you are playing these off the tee box or from the fairway, the woods do a wonderful job of getting the ball into the air to maximize distance and carry. If there is a solid complaint about this set, it is that there is too much space between the 5-wood and the 5-hybrid within the set. Many companies believe that beginners and intermediate players don’t need that longer hybrid, but in our opinion, that leaves too large a gap for your needs on the course. Moving onto the graphite-shafted irons, Wilson has created a solid four-iron set that covers the 6-thru-9 iron range of clubs. These cavity backed irons have a low center of gravity as well as perimeter weighting that keeps the club locked in at impact. Perhaps our favorite club in this set, however, is the two wedges. The pitching and sand wedge both have a unique look and design that rivals the feel of most higher end wedges. The performance of the wedges in this set blew us away with their solid feel and high spin rate. All in all, this Profile XD set is worthy of serious praise. The Nitro Golf Ladies Blaster 15 Piece Complete Set is ideal for the mid-handicapper looking for a set that is adaptable to other clubs that flesh out the full set. Although the Blaster set is missing a sand wedge, the irons still deliver a positive experience while the three woods included offer a nice range of clubs that will help lift the ball off the ground. Heading the wood set is a 12-degree driver that has an oversized head and a generous sweet spot that keeps the ball inside the fairway through the driver’s exceptional forgiveness. The three wood is a little on the small side and, at 19-degrees in loft, works better as a hybrid than a fairway wood. Rounding out the set is a 21-degree hybrid that does an excellent job of making solid contact with the golf ball. What we loved about these graphite-shafted irons is that they are a bit on the heavier side with the weight evenly distributed around the perimeter to promote forgiveness as well as keeping the club low through the impact zone. Additional weight has been centered on the irons directly in the heart of the sweet spot for maximum trajectory on shots from a variety of distances. The irons run from a 5-iron through a pitching wedge in the Blaster set. As we mentioned before the lack of a sand wedge is disappointing, but the oversized mallet putter helps make up the difference as the unique shape, and solid weight promoted consistently true roll during our testing. Perfect for the golfer who is just beginning to understand the game, the Nitro Golf Ladies Blaster 15 Piece Complete Set is a substantial next step to help assist you in your golfing journey. From Top Flite, the Women’s XL Golf Set is a blast to play. Ready to go to the course the moment you lift it from the box, this golf club set features woods that do a terrific job at keeping the ball on target as well as forgive your off-center strikes. The five irons in the XL set are designed to keep your face square at impact and can improve the distance and accuracy of golfers of any skill level. The showstopper of the XL set is the 460cc driver with a composite head that has lowered the center of gravity to create long distance with extraordinary forgiveness. The other two woods have a low profile that helps drive the golf ball deep and long from the fairway. The irons benefit from a wide sole that helps tear through the turf to make sure that the first thing that contacts the ball is the club face. For beginning golfers, a wide sole keeps the club steady and low to the ground for enhanced contact. In the XL set, the sole is perimeter weighted to maximize forgiveness holding the ball along your target line. Although there is no sand wedge in the Top Flite XL set, the pitching wedge and putter perform admirably around the green. The winged mallet putter does a great job at keeping the ball on line while reducing the skidding that knocks a putt away from the hole. 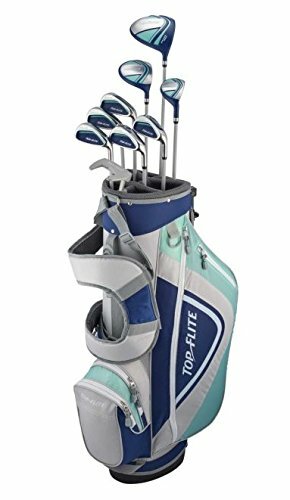 For the beginner, the Top Flite Women’s XL Golf Set is an excellent place to begin your golfing career. 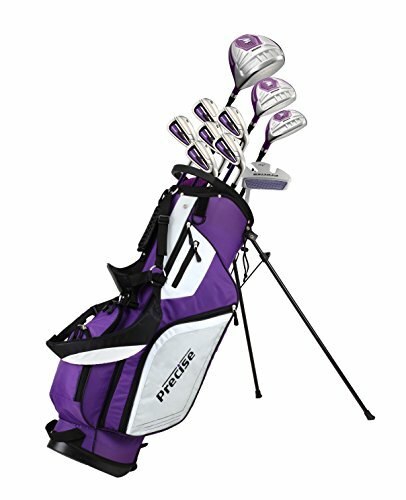 The Precise M5 Ladies Women’s Complete Golf Club Set is an ideal starter set for the young woman who wants to learn the great game without spending a significant amount of money. This affordable set covers a lot of bases that will help any beginner perform in style with the unique purple finish. Accompanied by a dual-strap bag that makes this set perfect for amateur tournaments, the M5 set is a solid choice for beginning golfers of any age. Even though beginners should turn their attention to the fairway wood and hybrid, when the time comes to learn the driver, the M5 set has a monster 460cc that performed well during our testing. Solid through the golf ball, all three woods did a solid job of achieving a nice ball height and moderate distance. The irons included in the M5 set are the 5-iron through pitching wedge. Again, it is disappointing that we have another complete set that has disregarded the sand wedge and although it is upon you to buy one, the reduced cost of the M5 set will certainly offset those future expenditures. During our testing, the irons stayed solid with their graphite shafts minimizing vibrations and aiding in providing solid contact on the golf ball. Completing the M5 set is a fine stand bag that complements the colors of the set well. In addition to the bag, the wide mallet putter was a standout, with the soft insert promoting true roll on the golf ball. For the learning golfer, the Precise M5 Ladies Women’s Complete Golf Club Set does a sound job at giving them the tools to succeed. When purchasing a complete set of clubs, it is essential to evaluate the construction of the clubs. Cheaply made clubs can dramatically affect performance due to low-quality materials and poor design. Each component of a club needs to be examined from the grip to the shaft and finally, the clubhead. As you look over the club set, answer one simple question: Who is the company that is making the clubs? If the clubs are made by companies such as Callaway, TaylorMade, and Wilson, then you’ll know that these clubs have the backing of millions of dollars in development and research. By examining the clubs beforehand, you’ll weed out sets that may break down quickly cause unnecessary expenditures down the line to replace these damaged clubs. For beginning golfers, the driver is the least important club in the bag. When you are developing your swing, the driver is the hardest club to hit and should be avoided when you are practicing. That said, this rule doesn’t stay true forever. As you increase your swing speed and your expertise, coaches will want to bring the driver into play. So although you may be in the early stages of your playing days, it is vital to make sure that the driver in your women’s set checks a few of the boxes. First, does it have a loft of around 12-13 degrees? Does it have a graphite shaft to help boost your ball speed? If you find a driver that meets these requirements, you’ll be a step ahead when it comes time to unleash the #1 wood. When you are evaluating the irons in a women’s complete club set, the quality and material of the shaft coupled with the flex rating are the two most essential elements. One of the hardest things to find when buying a complete set is finding the right fit for your game. This is why it is critical to take the time to find irons that have graphite shafts that are rated at a women’s flex. Graphite shafts allow for a softer flex that helps slower swingers easily return the clubface to the ball in the square position at impact. By purchasing clubs with these two specifications, you’ll find that your shots, during play or practice, will have a better feel and look after coming off the clubface. The quickest way to lowering your score is by improving your skills around the green. This improvement comes via mastering the wedge game and steadying your putter when you are on the green. When purchasing a complete set, some golfers will run into a common problem: Most sets only come with one wedge. And not only do they come with just one wedge, but it is typically a pitching wedge that has a loft of 48 degrees. Most amateurs need higher lofted wedges to help navigate through sand and high rough alongside the green. For the putter, it is important to know what style you prefer; whether it be blade or mallet, you must check the style of the putter in the set you are purchasing. Otherwise, you may have to shell out more money for a specific putter that meets your standards. Complete sets are popular among amateurs because they offer a simple way to hit the course without having to buy or search for additional products. From having a complete set of clubs, most companies include a bag and other amenities to make it simple to load up and play 18 holes. The most common accessory found in complete sets is a bag. There are two types of bags typically found in these sets, and they are cart bags and stand bags. Cart bags are made for use with a golf cart. They have no stand but do offer more room for your golf balls, tees and other items you may bring to the course. Stand bags have two pop-out legs that help keep the bag off of the grass when walking the course. What are the differences between a men and women golf club set? The difference between men and women’s golf club set comes down to the technology used in the construction of the clubs. Each golf club consists of three parts: the grip, the shaft, and the club head. Grips are the only part of the club that is quite similar for both men and women, although women’s grips are typically smaller due to the size of their hands. The real contrast lies in the other two components of the golf club. Amateur men, on average, have higher swing speeds than amateur women. As a result, the shaft flex and club head weight will differ for each gender. These differences are specially designed to help both golfers maximize their ball height and distance. You may see professional female golfer use modern equipment regularly found on the men’s PGA Tour, but that is due to their exceptional swing speed. 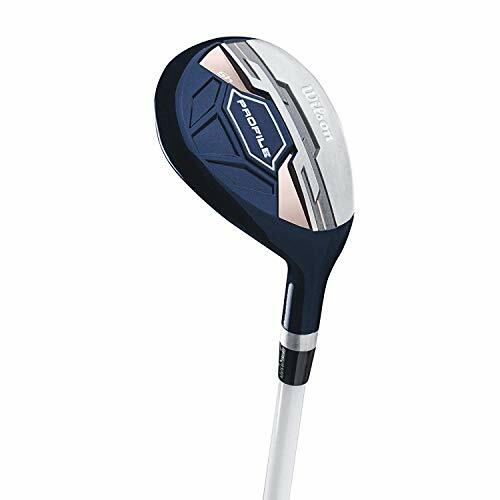 When you look at specific clubs, such as the driver, it is commonplace for women’s drivers to have more loft. Whereas a male might use a 9.5-degree driver off the tee box, with slower swing speed, a women’s driver may have more loft, say a 12-degree driver, to promote ball flight. Irons found in ladies’ sets also differ when it comes to the material used in the shaft of the club as well as the flex rating. Most women’s irons will have a graphite shaft instead of stainless steel. Manufacturers use graphite because it is lighter and will increase swing speed. Graphite also allows for a softer shaft flex which helps slower swings return to square when hitting the golf ball. Ladies’ sets will also have club heads that are a tad heavier than a male-counterpart club. This difference in weight is because a heavier club head will stay lower to the ground, improving contact at impact. What clubs should a great women's’ golf club set include? In breaking down what clubs are ideal for a women’s golf club set, it is essential, to begin with the short game and work your way to the driver. Most amateurs make the mistake of looking at the woods included as a marker for the quality of the entire club set. By doing this, the amateur ignores a simple fact that the majority of their shots will take place with lower irons, wedges and their putter. In most sets, companies will try to skimp and save by creating a low-standard putter. It is vital when evaluating a set that you take into account, the company’s reputation for building quality clubs, with an emphasis on putters. Make sure you know if the set comes with a mallet-style or blade putter. If you have a preference and the set comes with the opposite style, then you’ll need to make some room in your budget for a putter upgrade. Next, when evaluating the wedges, look to see how many come with the set. 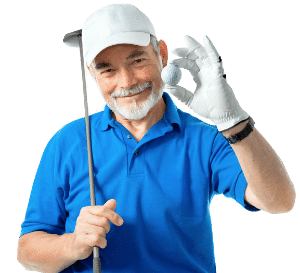 Most complete sets will have a pitching wedge but not a sand wedge. You’ll want a wedge with a degree loft that stands around 56, the average loft of a sand wedge. With the irons, it is important to see if the irons start high, say around a 5-iron, with the 3 and 4-irons being replaced by hybrids. Hybrids are easier to hit and for amateurs, make more sense. Check the shafts of the irons as graphite-shafted irons are lighter and will increase swing speed. Finally, with the woods, the most important feature you are studying is the loft. You’ll want to find a driver that is around 12-13 degrees of loft. This additional loft will help get the ball in the air and maximize your distance.